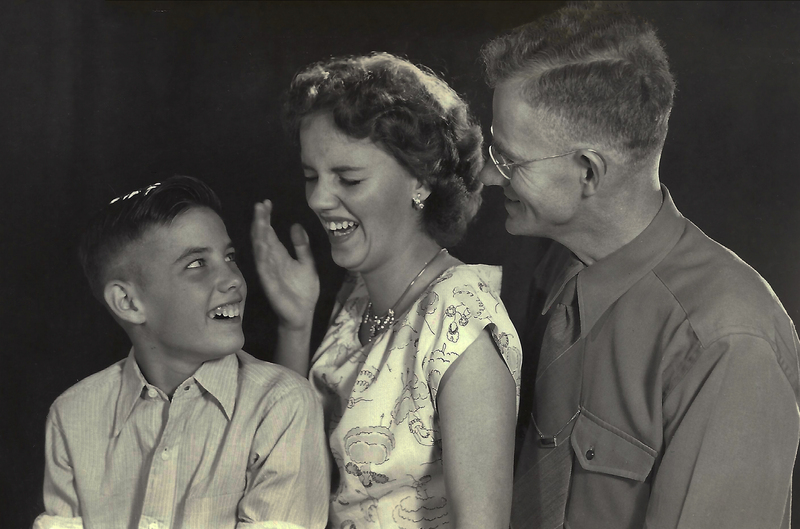 I think this photo of my grandma, her brother, and father is delightful. I wonder what got my grandma laughing? That is lovely. I really love shots like that. We have some great little sheets of photos of my mother in law as a child having a portrait done, so got the proof sheet of all the shots taken, and I printed out two little shots of her laughing to put in a frame for my husband about a year after she passed away – and did similar ones for his two sisters. I think they are much nicer than any posed shot. Thank you. What a nice gift idea, I’m sure it’s a treasure for your loved ones. I agree, a good candid shot is much better than a posed shot. I LOVE this photo! It’s a moment of real life that sneaked into a portrait shot. Wonderfully happy and lively. I think it should go above the fireplace! Thank you, I really love it. Thanks for stopping by! As above … this really is a wonderful shot. Your grandmother looks like she’s got such a fit of the giggles. Thank you, I really love it. She does look like the giggles are winning for sure!